Jimmy Kimmel Live! viewers were treated to the first official viewing of the new black and red suit in Spider-Man: Far from Home last night. Tom Holland appeared on the show, which was shooting in Brooklyn for the week. The appearance was first teased on social media earlier yesterday, and many Marvel Cinematic Universe fans were sure that the young actor was going to spoil either the Spider-Man sequel or the upcoming Avengers 4, but that wasn't the case on this particular evening. 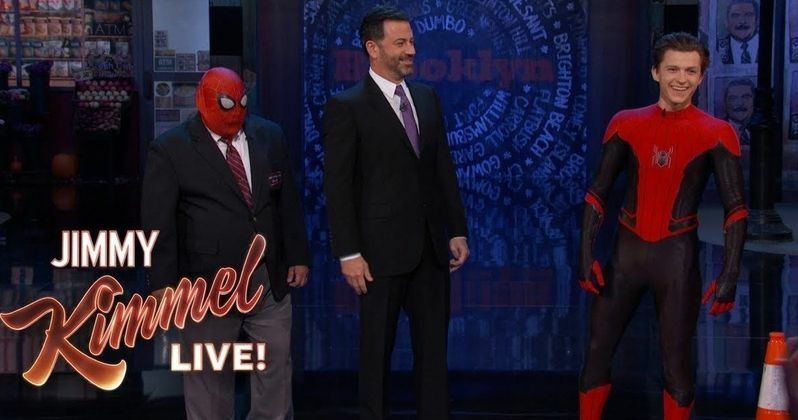 Jimmy Kimmel's sidekick Guillermo came out on stage wearing the iconic Spider-Man mask and making weird web-slinging noises. Kimmel seemed to be a little confused about what was going on, which only escalated when Tom Holland comes out with a parking cone on his head, accusing Guillermo of stealing his mask. Holland then takes off the cone, revealing himself to the crowd, which gets a huge reaction from the shocked audience. It's a short bit, but the most important thing about it is that it's the first official look at the black and red costume that had previously only been seen in leaked Spider-Man: Far From Home set photos and videos. Tom Holland talked to Jimmy Kimmel for a little while, and the host pretended to be surprised that they were making a sequel after what happened to Peter Parker in Infinity War. The late night host then asked if Spider-Man: Far From Home was a prequel or a true sequel, which led to Holland avoiding the question by stating that he had to leave because Thanos was robbing a bank. Marvel Studios boss Kevin Feige had previously announced that the sequel takes place directly after the events of Avengers 4. Spider-Man: Far From Home just officially wrapped principal photography after filming all summer around Europe and New York City. Some reshoots will more than likely occur during the post-production process, but probably not until the spring. Tom Holland was also recently on the set of Avengers 4 in Atlanta for reshoots, which recently wrapped production as well. It's believed that the Russo Brothers will be working on the film all the way until April and then will have to go out on the road to promote the highly anticipated film. Tom Holland has a reputation for spoiling movies in the MCU and Jimmy Kimmel was well aware of that fact when he tried to get some information out of the 22-year old actor. Holland's reputation has led to some carefully orchestrated leaks for promotion, but he has legitimately spoiled some pretty big events, like when he revealed the ending of Infinity War in front of a sold out audience on the opening night of the movie. Regardless, Holland will have to go out and promote Spider-Man: Far From Home soon, which means that the spoilers could be on their way. You can check out the video of Holland showing off the new black and red suit below, thanks to the Jimmy Kimmel Live! YouTube channel.